← When is Coronary Angiography Needed in an Emergency Department Patient With Chest Pain? Are the Patient’s Symptoms Due to An Acute Coronary Syndrome? Patients presenting to the emergency department with chest discomfort or other symptoms that are due to an ST elevation myocardial infarction, a non-ST segment elevation myocardial infarction, or unstable angina are said to have an acute coronary syndrome (ACS). So how do we determine if the patient’s symptoms are likely due to an acute coronary syndrome? 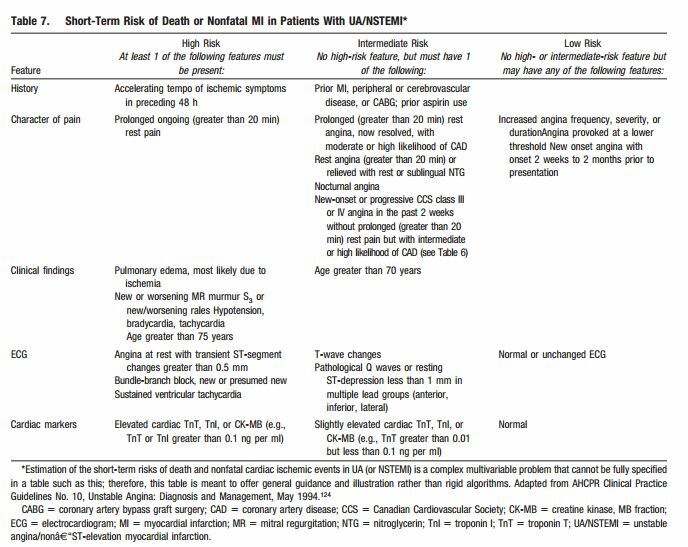 The 2011 ACCF/AHA Focused Update Incorporated Into the ACC/AHA 2007 Guidelines for the Management of Patients With Unstable Angina/Non−ST-Elevation Myocardial Infarction gives the following guidance (Table 6, e441). a. Chest or left arm pain or discomfort as chief symptom reproducing prior documented angina b. known history of coronary artery disease including myocardial infarction. This entry was posted in Advanced Cardiac Life Support, Cardiology, Emergency Medicine, Guidelines, Internal Medicine and tagged abnormal electrocardiogram, chest pain, elevated troponin. Bookmark the permalink.